Only a few copies left. Price will increase as number of copies decreases. Arthur, Paul, “Structural Film: Revisions, New Versions, and the Artifact Part Two,” pp. 122-34. Balazs, Bela, “Build An International Union of Revolutionary Cinema,” trans. Mel Gordon, pp. 7-13. Bartone, Richard, “The Forms of Repetition: Larry Gottheim’s Four Shadows,” pp. 167-71. Biro, Yvette, “Landscape During the Battle,” pp. 117-21. 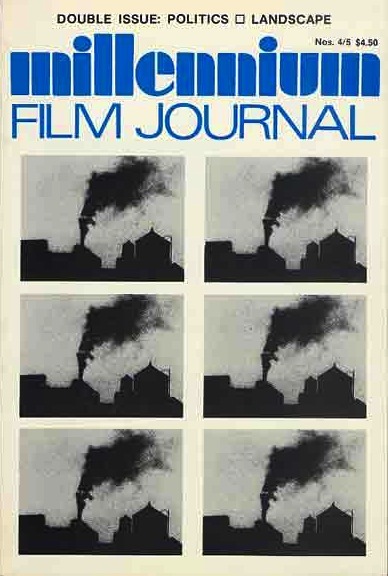 Boddy, William and Jonathan Buchsbaum, “Cinema in Revolt: Newsreel,” pp. 43-52. Brinckmann, Christine Noll and Grahame Weinbren, “The O’Neill Landscape: Four Scenes from Foregrounds,” pp. 101-16. Carroll, Noel, “Avant-Garde Film and Film Theory,” pp. 135-43. Cohen, Phoebe, “Brakhage’s Sincerity III,” pp. 153-56. Dozoretz, Wendy, “Robert Nelson’s Suite California Stops and Passes,” pp.160-63. Estevez, Sue Ann, “Bruce Baillie’s Roslyn Romance (Is It Really True? ),” pp. 164-66. Friedberg, Anne, “Misconception=The Division of Labor in The Childbirth Film,” pp. 64-70. Friedman, Lester D., “An Interview with Peter Wollen and Laura Mulvey on Riddles of the Sphinx,” pp. 14-32. Gordon, Mel, “German Workers’ Films 1919-32: Some Thoughts About the Red Front in Film,” pp. 5-6. Gottheim, Larry, “Sticking in/to the Landscape,” pp. 84-92. Grindon, Leger, “The Films of Peter Hutton,” pp. 175-78. Hanlon, Lindley, “Arson: A Review of Otherwise Unexplained Fires by Hollis Frampton,” pp. 157-59. James, David, “Towards a Radical, Popular Cinema: Two Recent Films by Jon Jost,” pp. 71-83. Kelly, Keith, “Notes for Jerome,” pp. 172-74. Peterson, Richard, “The Films of Linda Klosky,” pp. 179-83. Simon, Bill, “A Completely Open Space: Michael Snow’s La Region Centrale,” pp. 93-100. Simon, Elena Pinto, “Robert Breer’s LMNO,” pp. 184-86. Stam, Robert, “Brazilian Avant-Garde Cinema from Limite to Red Light Bandit,” pp. 33-42. Tartaglia, Jerry, “The Gay Sensibility in American Avant-Garde Film,” pp. 53-58. Taubin, Amy, “And what is a fact anyway? (On a Tape by Martha Rosler),” pp. 59-63. Ward, Melinda, “Independent Film in Minneapolis/St. Paul,” pp. 144-52. Weinbren, Grahame and Christine Noll Brinckmann, “The O’Neill Landscape: Four Scenes from Foregrounds,” pp. 101-16.